District Health Society, N.H.M. 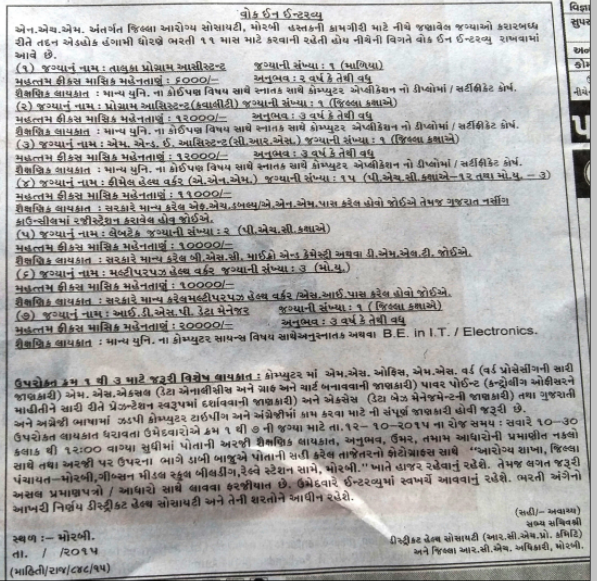 Morbi has published a Advertisement for below mentioned Posts 2015. Check below for more details. Any Graduate , Computer Application Diploma / Certificate Course. F.H.W/ A.N.M Pass and Having Registration in Nursing Counsil. Post Graduate or B.E. in I.T./ Electronics. Venue : Health Department, District Panchayat, Morbi, Gibson Middle School Building,Opp. Railway Station, Morbi. Time : 10:30 a.m. to 12:30 p.m.